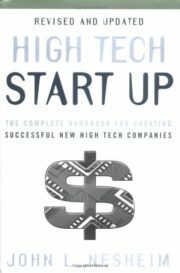 This revised and updated edition of Nesheim’s underground Silicon Valley bestseller incorporates twenty-three case studies of successful start-ups, including tables of wealth showing how much money founders and investors realized from each venture. The phenomenal success of the initial public offerings (IPOs) of many new internet companies obscures the fact that fewer than six out of 1 million business plans submitted to venture capital firms will ever reach the IPO stage. Many fail, according to start-up expert John Nesheim, because the entrepreneurs did not have access to the invaluable lessons that come from studying the real-world venture experiences of successful companies. Now they do. Acclaimed by entrepreneurs the world over, this practical handbook is filled with hard-to-find information and guidance covering every key phase of a start-up, from idea to IPO: how to create a winning business plan, how to value the firm, how venture capitalists work, how they make their money, where to find alternative sources of funding, how to select a good lawyer, and how to protect intellectual property. Nesheim aims to improve the odds of success for first-time high-tech entrepreneurs, and offers an insider’s perspective from firsthand experience on one of the toughest challenges they face — convincing venture capitalists or investment banks to provide financing. This complete, classic reference tool is essential reading for first-time high-tech entrepreneurs, and entrepreneurs already involved in a start-up who want to increase their chances of success to rise to the top.